It's that time of year again! 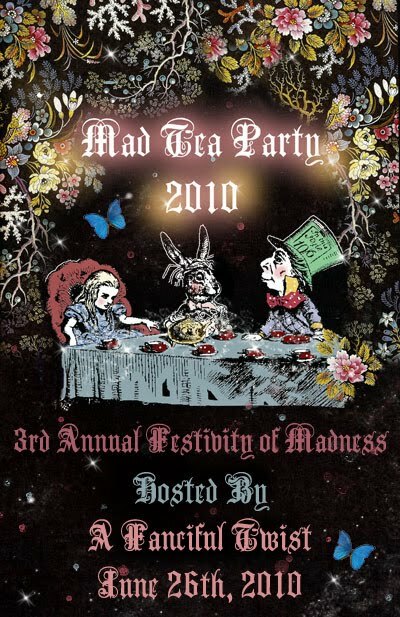 A Fanciful Twist is hosting the annual Mad Tea Party. I have been visiting all these Fabulous parties she throws for a few years, but haven't taken part in any. I signed up for the Halloween party but had to drop out, partly due to procrastination but mostly because we ended up moving right in the middle of it. So, I'm putting this post up as a public proclamation that I will be joining in on the Mad Tea Party 2010 (barring any unforeseen circumstances). Maybe that will stave off the procrastination bug. Now I just need to find that &@!# Muse that has been hiding from me lately. I know! I read her post last night... how exciting! I can't wait to read yours when the time comes. I too signed up for the Halloween party last year, but my mother was sick by then, so I had to drop out. I am just joining the tea party as a spectator most likely this year.